Now as of today, the FDA is now taking the warning to the most extreme level, the Boxed Warning. The FDA Black Box warning is the highest level of warning issued to drugs. Many times if a drug continues to have adverse affects, it may then be recalled by the manufacturer or issued by the FDA. The new data was complied by two very large and new clinical trials, the CANVAS (Canagliflozin Cardiovascular Assessment Study) and CANVAS-R (A Study of the Effects of Canagliflozin on Renal Endpoints in Adult Participants With Type 2 Diabetes Mellitus). In these two studies the researchers warn of the increased risk of leg and foot amputations. 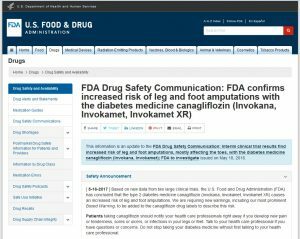 FDA is requiring new warnings, including the most prominent Boxed Warning, to be added to the canagliflozin drug labels to describe this risk. Not the only FDA warning for Invokana. On top of warnings from the FDA, there are more concerns when it comes to this drug. The Institute for Safe Medication Practices (ISMP) published a warning in their May 6th edition of Quarter Watch which warns about a number of adverse reactions being reported to the FDA about Invokana. In the first year after Invokana was released, there were over 450 adverse event reports filed. Learn about the Invokana lawsuits going on.